Do you hear a ticking noise from your dash when the ignition key is on? Does your car heater blow cold or the air conditioner blow hot? 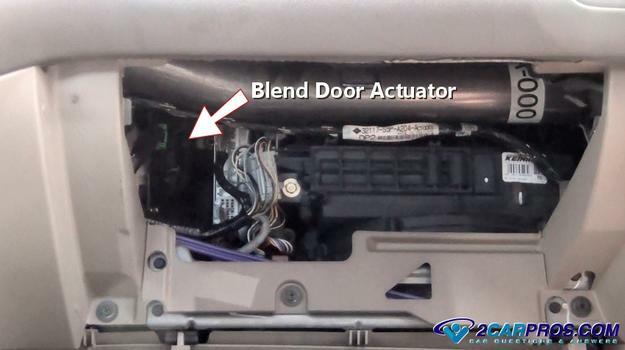 These are signs that a blend door actuator has gone bad. 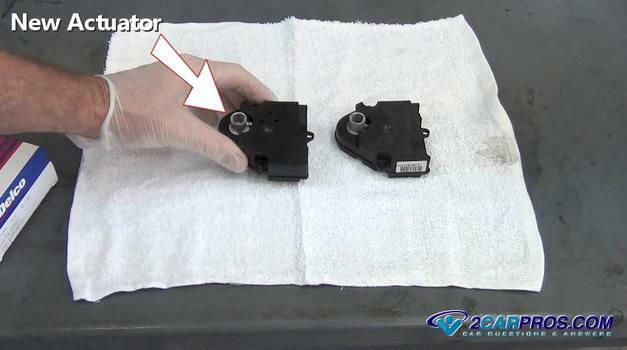 With a little help from our team of ASE certified mechanics and about a half hour of your time you can replace this part to get your climate control back working again. Or you can see what you are paying for when taking your car in for repairs. A blend door actuator is made up of an electric motor that turns a plastic gear set in one direction or another which is connected to an air control door pivot at the final drive of the unit. An actuator can go bad in of two ways; first the electric motor can burn out rendering the unit non-responsive so nothing changes when the temperature or vent mode controls are moved. Next, the plastic gear set will become brittle and break which will sometimes allow the unit to work while making a ticking or clicking noise and then stop. This is a common problem in most car's heater and air conditioner systems. 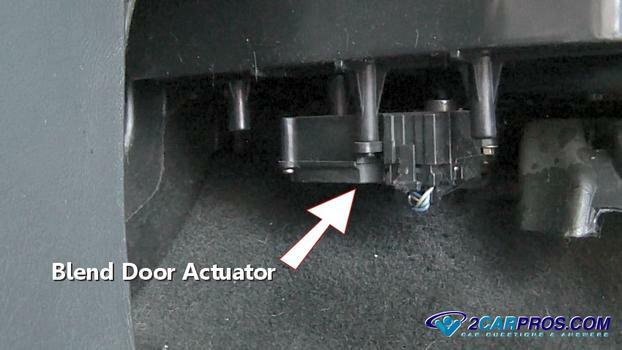 An air blend door actuator is constructed from a plastic housing, a small electric motor and a plastic gear set. A door position sensor is also incorporate into the unit to send feed back information to the climate control computer. This actuator then moves temperature and air direction doors inside the heater plenum (box) which are designed to control mode settings such as temperature, floor, mid vent, defrost and fresh air or re-circulation modes. They also control hot and cold settings for right and left passenger compartments. 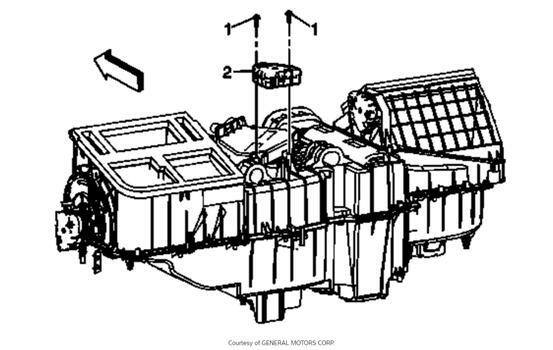 Your car's climate control computer gives an electrical command to the actuator to start moving the actuator motor to change air direction modes. This direction is according to the temperature chosen by the driver or passenger on dual climate control systems. Most systems have three to four of these units placed in various areas around the HVAC plenum that control mode operation and will vary by the car make and model. 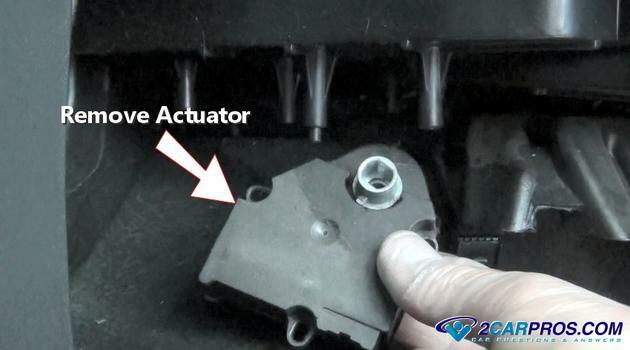 You can get an OEM replacement actuator from Amazon for what the garages pay for them in most cases. You will need a tool set including an 5.5 mm socket for Chevy, GMC, Cadillac, Ford and Lincoln vehicles. 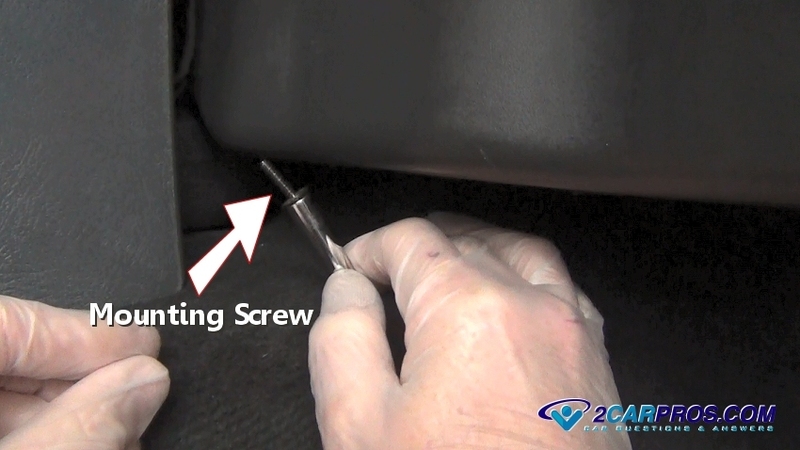 Using a small socket and ratchet remove the mounting bolts that hold the under dash plastic cover on the passenger side. These screws can be in obscure places so look around for them. 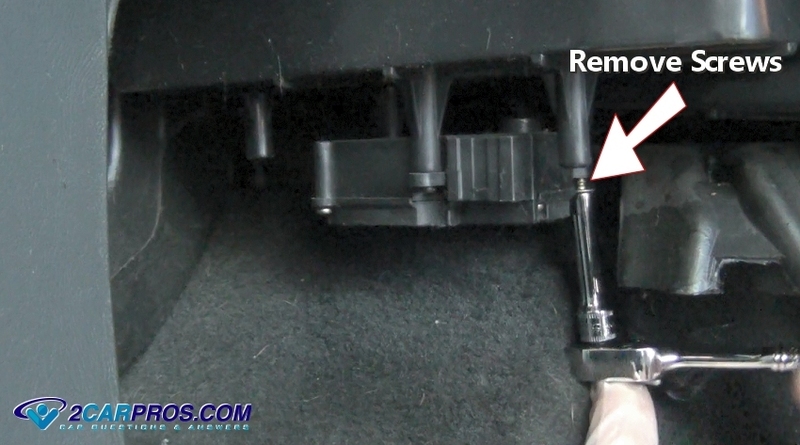 Once you have located and removed all of the mounting screws grasp the cover and gently pull it from the underside of the dash. This will expose the heater box with various controls including any wiring. 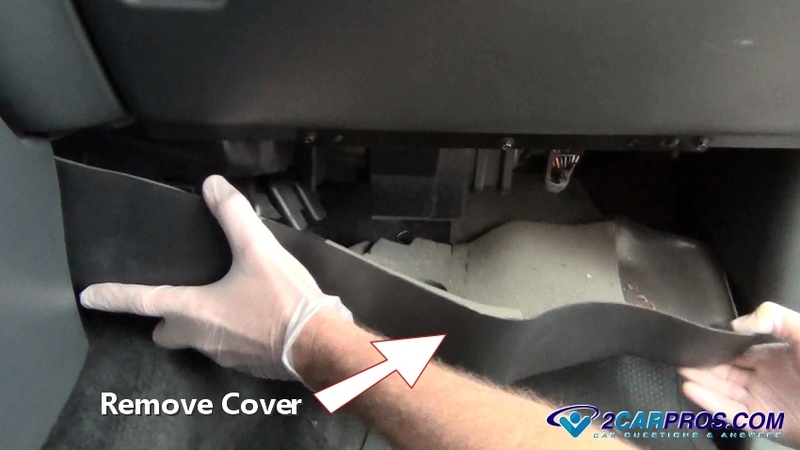 Here is what it looks like when the glove box is removed exposing the blend door actuator for replacement. Here is a typical right side temperature actuator used for dual climate controls (also temperature for signal mode units). This actuator hangs below the box which is one of the easier units to replace. Begin by using a small screwdriver to release the wiring safety clip on the harness for the actuator. These clips can be brittle and break so be gentle. Once released gently pull down on the wiring connector and remove it from the blend door actuator. 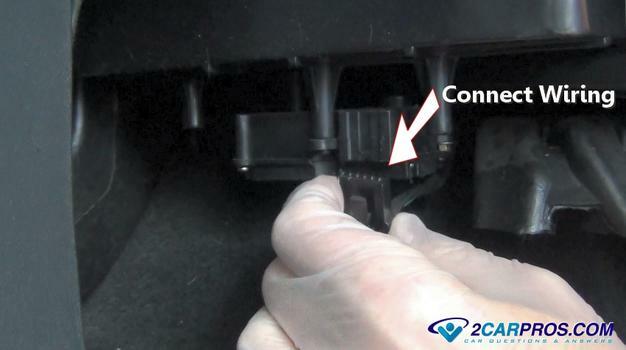 Inspect the connector for rust or corrosion and clean as needed. Locate and remove the actuator mounting screws. There should be two or three screws holding it in place. A small universal might be needed to help remove the screws in awkward places. Once removed place the screws into a small container so they don't get lost. Once all of the mounting screws have been removed the actuator should become loose. 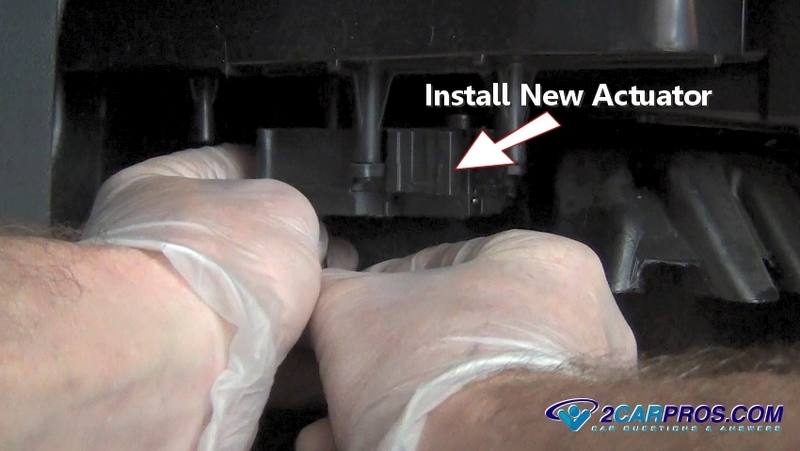 Grasp the actuator and pull it from its mount to remove. Before installing the new actuator it's a good idea to manually turn the blend door in both directions to ensure it is not stuck which will cause the new actuator to fail. Grasp the door pivot and move it back and forth to its full travel, it should move freely. If you cannot move the blend door an obstruction has gotten in the way of the door movement which will make the new actuator fail. These obstructions can include: pen, tooth pick, small toy or bubble gum to name a few. If the door is stuck the heater plenum with need to be removed and the problem resolved before installing the new unit. 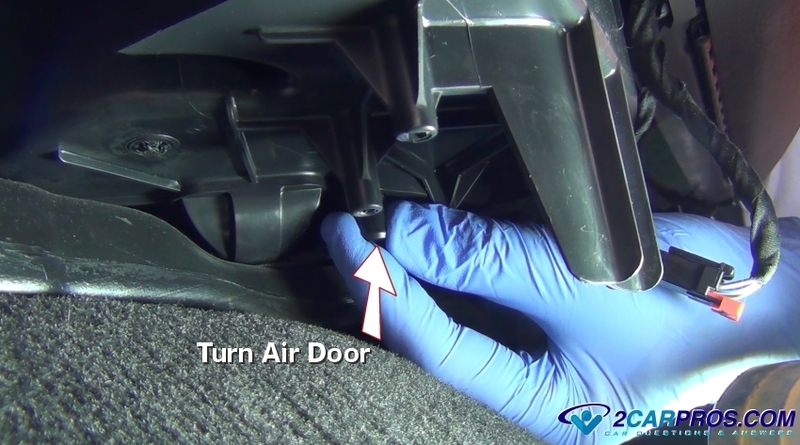 To test the blend door operation and too double check that you are changing the correct actuator motor turn the blower motor on and work the door in each way. You will be able to feel the air change temperature or vent level. Compare the bad actuator to the new unit. 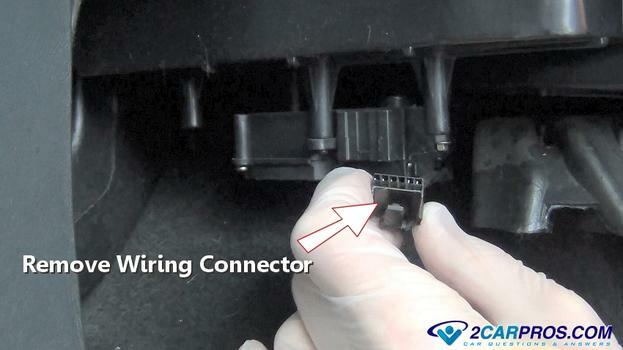 Be sure to check the wiring harness connector terminals they should match identically. Now the new part is ready to be installed. Install the new part in place as you insert the mounting screws by hand. Be careful not to cross thread the mounting screws because they thread into the plastic housing and can easily strip, (do not over tighten). Once all screws are in place firmly push the wiring harness connector back into the actuator. You should hear a click signaling the correct installing of the connector. 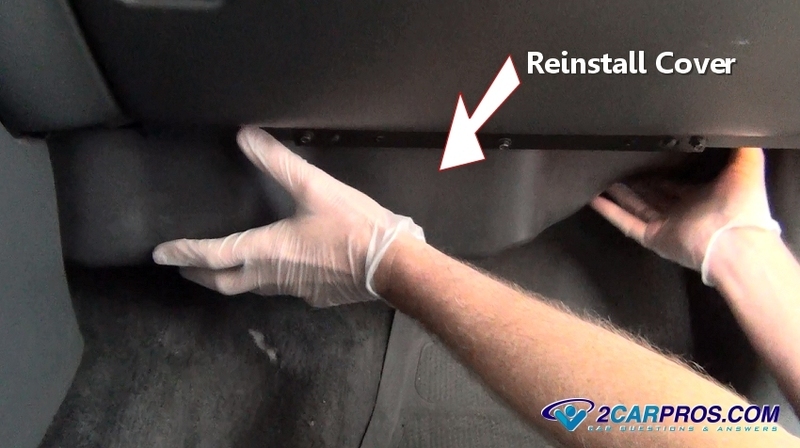 After the installation is complete double check your work and reinstall the plastic cover. This can take some jostling to get the bolts holes lined up so hang in there. Once the cover is in place start the installation of the mounting screws by hand, once hand threaded install the remainder of the screws. Do not tighten the first screw you have threaded in until all of the screws because it will make the remainder of the screws harder to install. After cover has been re-installed start the engine to test the repair job by turning the climate control on and moving the controls from hot and cold and from defrost to the mid and floor positions to ensure the new actuator is working as it should. Here is this job being done to pick up on additional tips and information before you begin. 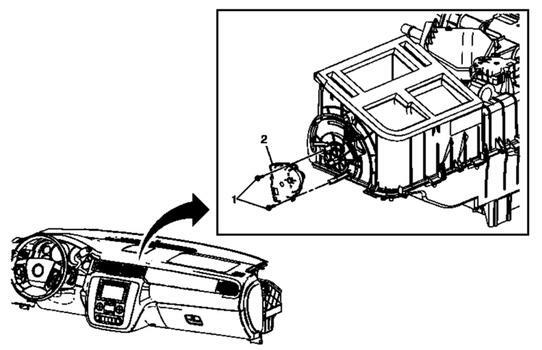 Begin by identifying the problem either defrost, mid or floor, or temperature modes not working. Then locate and identify the actuator to be replaced. These units can be either hanging in front of you or in a little more obscure places such as on the side the HVAC plenum. Sometimes they can be located in inconvenient places like the top of the heater box. 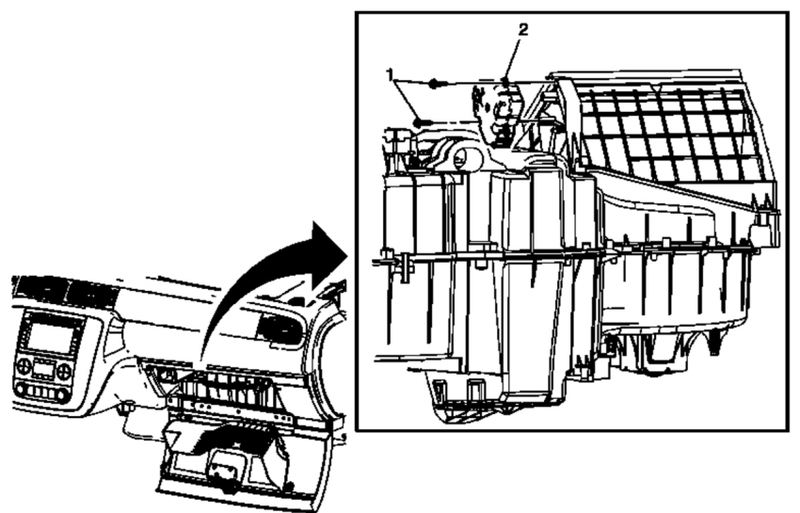 These repairs can take a little longer because more parts need to be removed to gain access to the actuator. 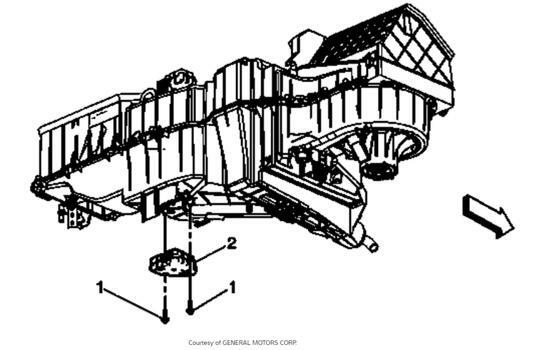 You can use a repair resource such as Mitchell1, a paper manual found on Amazon or a resource like Google images to locate the particular area in which the actuator needs to be replacement. Here is an example of a Silverado, Suburban and Tahoe locations. If you have any questions about blend door actuators please visit our forum. If you would like to ask our community of mechanics for advice please do so, we are happy to help.